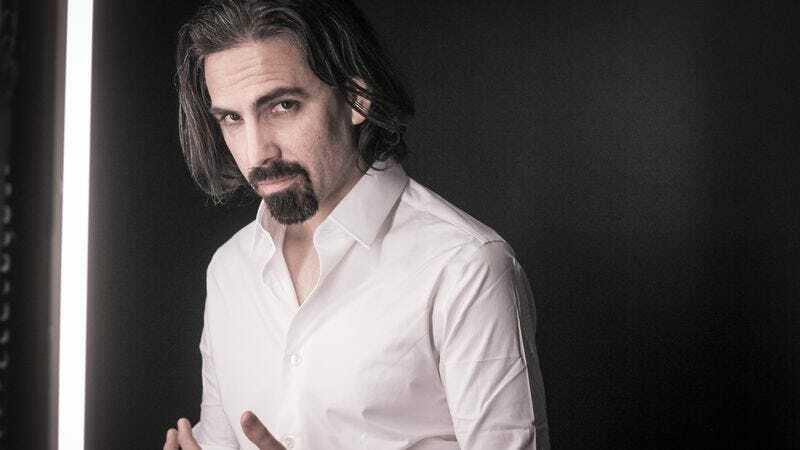 There aren’t many composers in the world of television who become almost as well known as the creators and stars of series, but Bear McCreary is arguably the closest thing to a John Williams that television has. The acclaimed musician and composer drew attention right out of the gate with his haunting and unusual scores and compositions for the cult Syfy series Battlestar Galactica. From there, McCreary went on to become a dominant force in genre TV, composing the music for almost 20 series over the past decade, including The Walking Dead, Marvel’s Agents Of S.H.I.E.L.D., Outlander, Black Sails, Eureka, and Defiance. Recently, he’s also been moving more into the world of film, having created the soundtracks for recent horror films The Boy and The Forest, as well as the just-released 10 Cloverfield Lane. Given his obvious penchant for stories that are scary, stressful, or just plain tension-inducing, The A.V. Club spoke with him about the challenge of creating a mood of anxiety for TV and film. The A.V. Club: So many of the shows you’ve worked on, like Battlestar Galactica and The Walking Dead and Agents Of S.H.I.E.L.D., are genre fare, known for ratcheting up tension as a key part of their DNA. Are there certain tools or tricks as a composer that you rely on to craft music meant to elevate anxiety? Bear McCreary: Yes. The short answer is yes. Let me give you the long answer: In the broadest and most pure sense, it’s the only thing that a score does. Every scene has tension—a comic scene, a romance scene, they all have tension, inherently. We are watching a character coming up against something that they will need to work around, whether it’s another character or themselves. On a fundamental dramatic level, no one ever watches a scene where someone walks into a room and everything is great, and then they leave the room. That doesn’t happen, you know? So, no matter what the genre is, the tension is… it’s Screenwriting 101. There’s always tension. So, on a granular level, that really is all we’re doing. Specifically, creating anxiety and suspense. I think the thing that music can do is be unsettling. It is abnormal—music that’s perceived to be different in an unresolved or unusual way. One of the first things you have to do in order to do that is create a sense of what is normal. You create a palette, a musical language, that you live in most of the time—so that you can deviate from it. To put that another way, if you play nothing but very dense, atonal, dissonant music constantly, the human ear gets used to it and will just put it away. It’s only in contrast to something else, whether it’s silence or music, that is less dissonant. When that change happens, it really starts to elevate the blood pressure subconsciously, so that’s what I’m very aware of regardless of the genre. I try to create a palette of sound, a musical world, themes, just a language that I can speak with the audience, and then I pick those moments when I start to really turn the screws harmonically and rhythmically to create any kind of sense of things being unresolved, which is where tension comes from. You yearn for things to be resolved. AVC: We have in our heads these ideas of what anxiety or tension sounds like—John Carpenter’s theme from Halloween, or the strings from Psycho’s shower scene, or Jaws. How do you conceive of the challenge of doing that in some new way? It sounds like part of what you’re saying is those sounds have almost become normal to us, as to what we expect tension or anxiety to sound like. BM: Oh, absolutely. I would take out the almost; I think you could say that. Tension, especially with regard to horror, is a very difficult thing to sustain in the big sense. I think it’s why you saw what I call a nuclear arms race of volume in horror scores from the late-’60s to the mid-’70s. You get John Carpenter, definitely what we would look back on as the more tasteful, minimal side. In the ’80s, things just started to take off, where you had to scream louder, and louder, and louder. And then by ’90s, in order to do horror films, you needed a full orchestra blasting at full volume screaming at your audience constantly, to the point where [Marco] Beltrami’s Scream, the movie itself, was a scream, you know? It was cool and subversive and satirical, but also it was functional. That is what you needed to do then. This was the subject of a lot of discussion when I was starting The Walking Dead, if I may just cite a specific example. I was working with [former showrunner] Frank Darabont on the first episode. We spent a lot of time trying to figure this out. Knowing that we had a 90-minute episode on our hands, but beyond that, hopes for a show that would go on. How do you sustain that kind of tension with an audience over a television series when you can see fatigue setting in over the course of a film? If you look at the first episode of The Walking Dead, the musical footprint is so light. It’s so minimal. The textures, the ensemble is small. The placement of music is very minimal. What I wanted to do was bring the decibel way down so that the score and the show itself were virtually silent. When the slightest string chord comes in, it has a big impact because you haven’t heard music for a long time, and what you’ve heard has been very minimal. Beyond that, it also helps because the story is about a guy who woke up from a coma, and the world had already disappeared. There were no planes, no trains, there’s no cars, there’s no radios. So, the emotional impact of just hearing the wind was powerful. It really made the approach to music much more sustainable. Definitely there’s more music now on The Walking Dead than there was. But, I mean, I’m closing in on… I don’t know, 75 episodes? And I feel like it’s still in a pretty manageable place. I still feel like I’ve got room to grow, you know? I think it was because we made such a conscious effort to start in such a minimal place. AVC: So by restraining yourself so much in that early going, it has allowed you to continue progressing and evolving, doing different and more things without feeling like you’re having to push the envelope, as you said, of taking it over the top. BM: Absolutely. Well, keep in mind that music is relative. Listening to music is like motion in physics. You know how when you start really realizing that anything moving is only moving in relation to something else? The notion that it’s even moving at all is purely subjective to what it’s moving in relation to. Music is the same thing emotionally, where it’s effective in contrast to what your experience has been up until that point. If you look at song form at its most basic: Why do we like a chorus? Well, it’s because there’s a verse. Why do we need a bridge? It’s because we get a little tired of the verse and the chorus, and the bridge allows us something else to clear our palate, and then we long for that chorus again. I think that with tension, and with film scores in particular, music is most effective when it’s entering or when it’s exiting, meaning the moment a cue comes in, or the moment a cue stops, is where you are at your most effective as a composer. But logically, what does that mean? That means the more that music isn’t doing one of those two things, the less effective it is. The longer it’s in, the more you have to actually do more and more to make a statement. I find a lot of times, my initial instinct is when something big happens in a scene is, “Oh cool, I’ve got to shift there.” And sometimes I stop and I think, “You know, that moment is speaking to me so much, maybe that’s actually the beginning of the music.” If there was something I wanted to hit prior to that, it might be better to just not hit that because, in exchange, you get the musical entrance on this other event. AVC: You already alluded to Walking Dead coming up on 75 episodes, but even on S.H.I.E.L.D. you’re well into season three. With shows where you’re continually reworking the themes and motifs, is a lot of it about finding that middle ground between reworking and recycling? Is it difficult to walk that line of not repeating yourself? BM: It depends on the show, and it depends on the project. The Walking Dead and Agents Of S.H.I.E.L.D. are very different in their construction, and I really have to take my writing cues from the show. And this started with Battlestar Galactica, which was very akin to Walking Dead—perhaps even more so because there was no source material to give a fan base hints. You have no idea what’s coming. Anybody could die at any given minute. The stakes are very high, and you need to evolve as the show evolves. On Battlestar, it started off feeling very military documentary, very cold. The first five or six hours of the show are just emotionally very cold. That’s what made it so powerful. No one had seen anything like that. But ultimately, in order to sustain drama, it needed to introduce some relationships, some more backstory. Ultimately, they even introduced sort of divine, prophetic, spiritual, magical—whatever you want to call it—elements that were very different, and that allowed this score to grow and evolve. Kara Thrace was so complicated. She didn’t have one theme; she had three, maybe four. She was such a dynamic person. If I really got to know a person in real life, and I was tasked with writing them a theme, I couldn’t. People are too complicated, you know? You contrast that with Agents Of S.H.I.E.L.D.. The stakes are high in Agents Of S.H.I.E.L.D., but in a different way. We have a core team. The stakes come from what is going to happen to them, what are they facing, what are the politics of what they’re dealing with, how are they interacting with each other, but by and large, they are on a network show. It’s just a different kind of evolution, and it’s more gradual, because you have a lot of episodes. In that regard, on a cable show, I feel like I’m trying to keep up with characters and trying to keep up with their evolution and their changing. The network show, I’m hoping to keep them grounded as they go through increasingly weird environments. Phil Coulson is definitely the root of that show, and while we’ve seen him endure some heartbreaking loses, especially in the third season, he’s there for us on that show. His music remains relatively consistent as he does. It depends on what the show really needs. AVC: Would you say you develop certain relationships with characters based on the music? For example, when you read a Walking Dead script, or see footage with Phil Coulson in a certain situation or emotional environment, does it trigger compositions you’ve already scored to accompany them? BM: I think so. I like to approach anything that I’m working on from the perspective of the audience. Ultimately, I’m here to serve the audience. Everybody working on something is there to create the ideal experience. Working on a score, to me, is very satisfying in that way because you really are at the end of the process. There’s not much else left. You are able to bring all your experience as a fan of that film, as a fan of that show, and you bring that emotional experience with you. That’s one of the things that makes long-form television so interesting, especially serialized storytelling. You have that emotional baggage that the audience has, only in a weird way, you’re not seeing a finished product yet. I feel like I’m on a journey with these people, so when I read a script, or when I see an early cut and a character goes through something really heartbreaking, I feel that. Just as a fan of the show, I can’t believe that’s happening. I get wrapped up in it. The only difference between me and the audience that watches the final version is I have some work to do before this is actually done. I think, “Wow, what a great experience. How can I channel my emotions into music that will only heighten the experience of somebody watching it with my final score?” And so, I think you rely on that. You have to consider everything the audience is bringing with them about their familiarity, their nostalgia, their experiences with characters, and you channel that into what you’re doing. AVC: When you’re starting a new project, does the score begin as a particular sound in your head? Or is it more that after you’ve seen it or read it, you start messing around with instruments and improvising, trying to figure out what matches the emotional journey you just went on? BM: It’s a little bit of both. I really value input from producers, and directors, and writers, and anybody I can talk to to get a sense of what the vision is. That said, I find that nothing is as valuable to me as my first impression, the first time I see something. I respond to visuals. I actually frequently don’t read scripts. I find that scripts are an invaluable tool for the writer to communicate to almost everyone on a film except for me. Because my work will be so greatly influenced by everyone who is influenced by the script: the actor’s tone, the way it’s lit, the way it’s directed, the way it’s cut together. These can cumulatively create a huge difference. Sometimes, I read a script, I imagine what it’s going to be, and I end up making decisions for all of those people. I’m directing it in my head. I imagine what it’s going to look like. I imagine what the editing room will be like. And then I imagine scoring it. And then when I get the real thing, it may not be that at all. I find my first impression is invaluable, and I often hear colors and shapes, contours, before anything else. I don’t immediately hear melody. Melody is my favorite part of music, and it’s the one I struggle with the most. I really have to tinker around with the melody for a long time, but I get a sense of color. Should the score have a large orchestral sound? Should there be voices? Should there be ethnic instruments? Should the score sound like a particular time and place? Should the score sound like no time, no place? These are all things that relate to what the audience experiences, especially because I’m essentially making music for an informed audience. I assume that the person listening to the score has seen a movie before, has seen television before. You’re not making it for Robinson Crusoe who just got off his island, you know? There’s a language of things you can draw from, and that’s really fun and useful. It’s sort of like a shorthand. You’re making a piece of art, but you’re making it for an audience that’s consumed a lot of the same things you have. So, I kind of try to play to that, and play against it. Sometimes I think, “Okay, this thing is like a thriller. What would I expect?” Now, let me take that off the table for a minute. What’s the negative image of that? How could you accomplish that with the exact opposite of that expectation? Battlestar Galactica was the perfect example of this, where the expected sound was a full, orchestral, big-sounding traditional score. Before my involvement in the show at all, it was decided that would not be the approach. That left a lot of things on the table, but the initial shock of getting rid of that really was a creative eye-opener. What should it sound like if not that, and are audiences going to be prepared for that? It’s hard to even remember, but that really was a controversial decision at the time, among many controversial decisions that show made that I don’t think would be controversial today. But, at the time, science fiction was supposed to sound a certain way, and in fact, the times that science-fiction television had deviated from that sound, I think the core fan base weren’t thrilled with that. So, the notion that I wasn’t going to be quoting Stu Phillips’ theme [from the original series] and putting it in a big orchestra just like before was a little daring at the time. The producers get all the credit in the world for having the vision to try something else. AVC: You said the decision was made before you even came on to reject the traditional score of the full orchestra. Is that a common element in terms of parsing musically what you’re going to do? The conversation you have with the director beforehand—there’s that joke about how directors often don’t know what they want, but they always know what they don’t want. BM: Yeah, it’s definitely not a joke. Let me just step back and say that when you’re talking with a director as a composer, you are most likely talking to that person in a way that’s different than the way they talk to everyone else. To everyone else, they can be very specific about what they want. Many directors have experienced doing what every department head is doing. The only reason they’re not lighting it, and designing the costumes, and rewriting the script, and setting up the camera is they can’t be in 10 places at once. That’s what the role of a director is. But with music, it’s different. Most of the time, that experience and that language is not there. You have to talk to them on their own terms. You have to talk to them about filmmaking. You have to talk to them about character. You have to talk to them in terms of things they’re comfortable about. This is a trick that I learned from Elmer Bernstein, who said over and over not to talk to a filmmaker about music. He said the most important thing—really the only thing—you need to talk to a filmmaker about when you’re a composer is, you ask them one question: What do you want the audience to feel? That question… now you’re speaking a common language. When you start talking about emotions, when you start talking about story, character, tension, structure: These are all things that I can load into my brain as a composer. Then, I’ll go home and start tinkering around in my studio and start translating that into music. If I have an understanding of what the answer to that question is, if I know what the audience is supposed to feel, everything else will come pretty quickly. AVC: You’ve been doing more film scores recently with 10 Cloverfield Lane and also The Boy and The Forest, both of which you did in the past year. These are either explicitly horror or have definite horror or suspense elements. What are the primary ways that the nature of each project shook out differently for you, in terms of how you conceived the score? These are three different films that have three very different kinds of horror. The Forest is as colorful and exotic as The Boy is traditional. The Forest takes place in Japan, and I brought in many Japanese soloists. I brought in a Japanese children’s choir singing traditional Japanese kids’ songs. One of the main themes of the film is a song that plays on crosswalks in Japan. I got this Japanese choir—I hesitate to even call them a choir. They were just a bunch of Japanese kids in Tokyo. They came into the studio, and I had them sing the little theme song that they know. And I just had them sing it slower, and slower, and slower, and then quieter, and then quieter, until they were whispering it like this fragile, brittle, little ghost of a sound, and it was really creepy. I mean, it was so cool that I had the sound of the film almost immediately. I was inspired by where the film takes place in Japan. It’s a real place. So, it really sounded nothing like The Boy at all. And then 10 Cloverfield Lane is itself very unique, and certainly is in no danger of sounding like either of those two scores. I’m very inspired by the projects I get to take on, and that’s usually a huge factor in what I decide to take on. I like to take on projects that force me out of my comfort zone, and force me to learn something I haven’t done before. AVC: Is there a main difference for you musically between how you conceptualize scoring these stand-alone films versus, say, a pilot of a show that could conceivably run for years? BM: Ultimately, I don’t approach them differently, because I always try to write music that could sustain for a long period of time. I like to write melodies that have what I consider musical DNA. I think of them as seeds. I think a good melody always does. A good melody, a good rhythmic hook, unique instrumentation—these are things that all have signature elements that, whether you’re talking about an 80-minute viewing experience or a two-hour viewing experience, there are ways of hooking the audience and unconsciously informing their subconscious mind about what they’re watching. When you do that in television, you can adapt a theme over many, many variations. Thematic writing is something I do on virtually all of my television shows, but even in film. It’s still equally powerful to have a theme that is memorable almost immediately. I think when you listen to and see 10 Cloverfield Lane, the first thing you hear as the Paramount stars are flying over your head in the logo, is the main character’s theme, and you hear it on a really weird instrument that is always the signature of her theme. It’s not a great melody. It’s not a timeless melody, but it’s definitely memorable and stands out. I think over the course of the film, you hear it in such a pronounced way in the beginning, like you cannot miss it, that I like to think the audience very quickly will get up to speed on the themes of that character. I use it throughout the film in some interesting ways, and I love that. I suppose it’s more important in television writing, to get to the soul of your question. Because you write a scene, but you might need to vary it up in ways you cannot foresee. A character, three seasons down the line, might switch from being a protagonist to an antagonist. You don’t know, so their theme better be malleable. At least with a film, you’re aware of everything you’re going to need from the beginning, and you can plan accordingly. AVC: Given your busier schedule, how involved are you able to stay with the week-to-week of shows that you compose for these days? The amount of time you’re able to have for S.H.I.E.L.D., Walking Dead, Outlander, and so on, versus when Battlestar was your daily, singular focus, are there specific choices you make in how you’re able to divvy up your time to juggle these different projects? BM: It’s an interesting question, because I grew up in the era where a film composer could do one thing, and when they were done with that one thing, they would line up the next thing. That’s really not the era in which we live anymore. It is success by volume in this industry. I’ve adapted my expectations accordingly. So, time management is something I’ve been working on for a long time. I definitely sleep a lot less than I used to, for sure. [Laughs.] The mornings get a little earlier, the evenings go a little later. I am a perfectionist, and it is very hard for me to let go of details. But I’ve also become a much more efficient writer, and I have built up a fantastic team that supports me in all things—orchestration, copying, sessions—there are things that I used to worry about 10 years ago that I do not think about for two seconds anymore. When I’m done writing my music, I bounce it off to the prep team, and the next time I think about it will be when I’m in front of an orchestra and I pick up a baton, and look down at the score. I don’t need to worry that the scores are going to get done. They’re going to be printed up, and they’re going to be virtually flawless, and that’s great. That peace of mind by having that support team makes it possible. I used to do everything. I orchestrated it all myself, I printed up the parts on my own printer, I taped the parts with my own hand, I walked out and put them on the stands. I did everything. When you let go of stuff like that—I don’t miss those things. If anything, my life as I’ve gotten busier has become more and more creative. I really have found ways to keep myself focused on doing the creative things that only I can do. In a weird way, the multitasking has forced me to offload the less creative stuff that ultimately isn’t as rewarding for me, you know? So, I get to spend my days collaborating with exciting people and writing music. It’s really fun. AVC: You’re remarkably open on your blog about the construction of your music, what certain musical choices are tied to narratively, and things like that. It really goes a long way to helping dispel this idea that creating great scores is something only tortured geniuses on pianos do. Is there a particular sort of creative satisfaction you get from sharing your artistic process so transparently with people? I started thinking about the composers I admired growing up, if they had had a blog, and I could have found them on the internet and asked them, “Why did you do that?”” And they responded to it? How cool would that have been? I felt like I was interacting with other score fans. It just so happened to be that I was the one writing the music we’re talking about, but we’re talking about the same things with the same level of passion. I experimented over the course of the third season with adding more and more detail, and the response got bigger and bigger. In the fourth and final season of Battlestar, I decided as an experiment to just pull the curtain back. Every episode of that show I wrote what could arguably be a college thesis on how it was done. Every scene, I put up notations, I put up audio clips, I put up images of the instruments, and it just really took off. Fans loved it. Music fans loved it. I found an immediate satisfaction. What was interesting, too, was getting feedback from the fans. Working on a television show, I could apply that to future episodes. As fans would ask me questions, I would start thinking about things I hadn’t thought of, and thought, “Wow. I’m already working on the episode that is only two weeks ahead of this. Maybe I ought to apply that. That’s a good idea. Maybe I should have the theme do this.” Or, I started putting little Easter eggs in. I would do something really extra musically obtuse and clever, and I wouldn’t blog about it, just to see if someone would ask. Sure enough, they always would. “Hey, did you intentionally put Boomer’s theme backwards in that scene?” I thought, “Wow, man. I did, and you caught it.” Since then, it has become a part of my creative process that, just sort of emotionally, I don’t feel like a project is done until I’ve blogged about it. In a way, it’s kind of become my diary, my journal, you know? I find my perspective changes so wildly over time that my perspective right when I’m done with it is wholly unique. I regret not blogging about the first two seasons of Battlestar. If I ever went back and did, it would be very, very different. I couldn’t even put myself in that mindset of when I was 24 and doing that. I can’t negate the 10 years of experience I’ve had. So, it’s interesting to me, and it’s fun, and people respond. It just kind of became a habit. I really enjoy it now. I like knowing there are people interested in the process—especially if I can help another aspiring composer, or even an experienced composer, crack a problem. I’m always fascinated in how composers solve problems. I love that idea.